Recline into pure comfort in the Hide-a-Chaise Recliner. The Comfort King® line of recliners can support up to 500 pounds, and with the extra-tall seat back, this particular recliner is ready to seat people of all shapes and sizes. Overstuffed, plush seating provide a cozy spot for you to kick back at the end of the day and fully relax. As a wallsaver, even a smaller room can have a comfortable chair. Use this recliner to update your den, living room or bedroom with the perfect spot to kick back with the television or a good book. The Stallion ComfortKing® Hide-a-Chaise Wallsaver Recliner by Lane at AHFA in the area. Product availability may vary. Contact us for the most current availability on this product. Fabric Options Available in approximately 600 fabrics by special order. Tailoring Our upholsterers are experienced craftsmen. Custom fitted covers are contour designed and tailored for maximum comfort. Skirts are quality-lined with pellon “Stay Straight” inserts. Frame Construction All hardwood components are made from kiln-dried lumber, double-doweled, glued, corner-blocked, and incorporate 8-gauge steel action brace construction. Padding & Ergonomics Custom made polyurethane padding in seats, backs, arms and ottomans for maximum comfort. Custom made polyurethane padding in seat for maximum comfort. Warranty Limited lifetime warranty for all reclining furniture mechanisms. All furniture undergoes a final inspection & operational test performance, passes a UFAC Class I inspection regarding flammability and receives the Good Housekeeping seal of approval. The Stallion Comfort King Recliner will surround you with thick padding and supreme comfort. From its button tufted back to its plush padded roll arms and ottoman, the Stallion will provide full body relaxation. 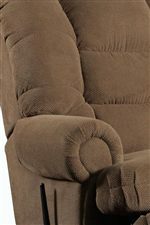 The ComfortKing® construction will make this big man's recliner tough and sturdy for years to come. The Stallion collection is a great option if you are looking for Casual furniture in the area. Browse other items in the Stallion collection from AHFA in the area.